With today’s timely deal you’ll get an Emporio Armani AR1779 watch to have you telling trendy time. This gorgeous timepiece features a pretty pink face, classic Roman numbers and dazzling diamantes circumventing the dial. Get a swanky Emporio Armani AR1779 watch. Pretty pink face, Roman numerals and trademark Emporio Armani logo. Dazzling diamantes around the dial. In a lovely presentation box. Tell the time in style! 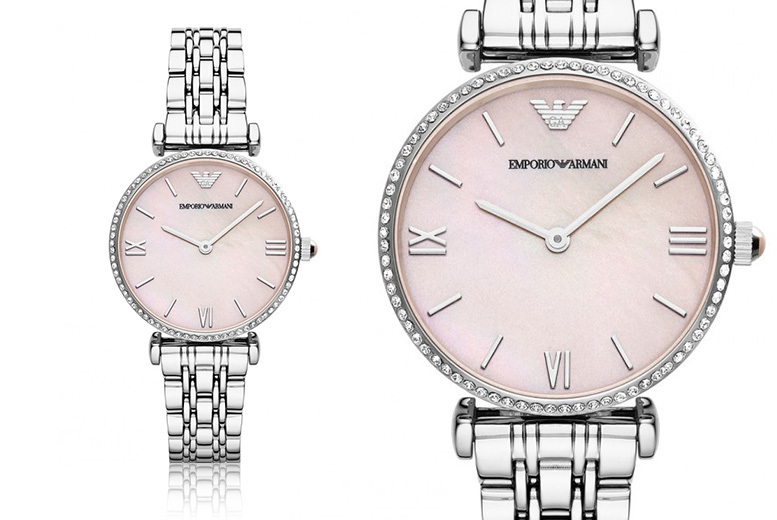 Topped off with the trademark Emporio Armani logo, this delicate watch is all you’ll need to tell the time in style. Making a great gift, the watch also comes in a presentation box with a two-year warranty! Perfect!